This personal snow plow has an average rating based on 17 customer reviews.
" If I were to have known about this plow sooner, I would have bought it! I have plowed three times now and think it is fantastic and the warm cab of my Silverado sure beats the cold open seat of my Allis Chalmers B. " " So far used once and does the job. I do have partial gravel drive and it pushed some gravel. I am ok with that as I do not have to shovel! It would nice if it came without having to drill holes. Happy with product! " " I read Donna's review and it inspired me . I am almost 60 and have been disabled with severe back problems , fibromylgia , and IBS . Pretty much bedridden . I have to have help just shopping and with household chores weekly and they have to be able to get off the road and park . I have a country drive and services just can't time things close enough to always have me cleared out . I bought the 180 because it is the lightest plow . It fits on the back of my handicap van and is a little wider then the vehicle . The most difficult part was putting on the rubber strip for me . I was able to get about 4 foot on then it was stuck . I greased it all up with butter and took a two by four and put it on the edge and pounded against it with a 3 pound brass hammer and 1/4 inch at a time got it on . I was lucky and had a nice set of dewalt power tools and new drill bits so the rest was a piece of cake . I bet it took about 30 minutes but I rested and turned it into a evening . The next day I mounted it on the truck . It looks great . I am going to get a strip of reflective tape to put across the top of the plow and some on the rear edges that stick out past the side of the van but I am all set . No snow as of yet but I have seen the films on youtube . I know it will work fine . I am on a 15 pound weight restriction but once it is hung I can lift one end at a time . Very well made and I am happy . The only downside is not being able to backdrag but the ability to go over grass is worth the trade off . That rubber strip is 1 inch thick and the whole plow well made . I am sure if I keep it under 5 mph as suggested it will hold up well . I too received my plow quick only 2 days to Michigan during a Holiday week . Thank you all so much for a quality product . Never again will a heavy wet snow threaten my health nor will I fear being stranded or letting visitors down . God Bless . " " Purchased this unit over 6 years ago and very glad i did. I do my driveway,my kids homes, and a small parkinglot for a small business.no problem,good results everytime. With the ease of installation an removal, and quality of materials, this will last me a very long time. I tell anyone who asks me how good it is. Great product. " " Not sure why I waited so long to buy one of these... If you follow the assembly instructions, you'll be fine... Without interruptions, 1 hour max for assembly... A second pair of hand could be useful with the rubber strip along with someone to talk too. NOW, just waiting for the first snow they say we will get tomorrow, 11/20/2015, 5-7". " " Very nice quality plow. Some assembly with drilling required, not too bad. I'll have to report back once it snows. " 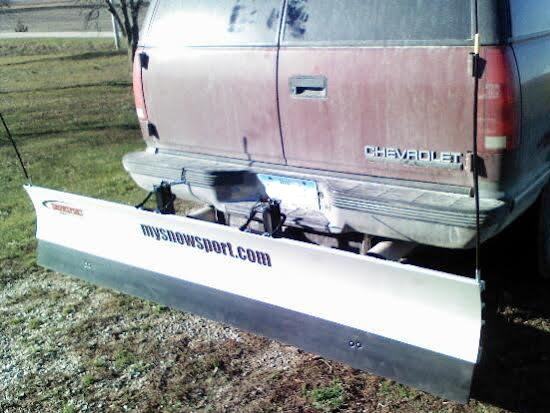 " I purchased the Snowsport 180 for my toyota truck and suzuki samurai. I can interchange the plow between vehicles It performs very good on steep snowy roads in the winter and can level gravel in the summertime. I highly recommend it for lighter 4x4's. " " Just a note to tell you that I think the SnowSport 180 plow is fantastic. I bought one in December and it has worked very well clearing snow from my 150 foot gravel driveway. It works so well that I sold my snow blower! It takes me about 10-15 minutes to clear the entire driveway, and the snow blower sometimes took a couple of hours. Now I can clear the driveway from the comfort and warmth of my truck cab! " 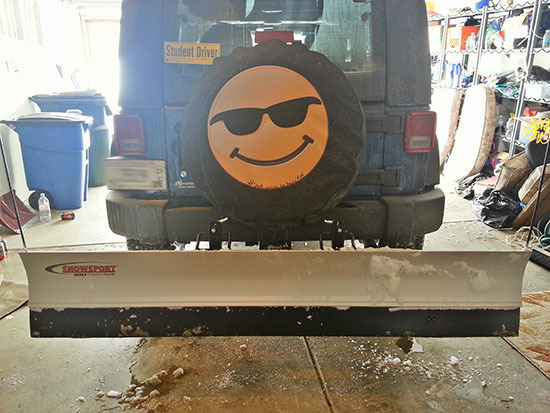 " I am so glad I got this plow! It is so easy to put together and I'm 56 with fibromyalgia and not in the best shape, lol! This is something I can put onto my Jeep and take off ALL BY MYSELF which makes life as a widow a whole lot easier!! The most difficult part putting together was drilling the holes (it was just 4) but I just think my drill was a bit too wimpy so it took took a lot of pressure on the drill to get through but I had my son help me on drilling the holes because I didn't have enough strength, probably because I had carpal tunnel surgery but lifting it onto my Jeep, like I said, is a piece of cake for me! I wish I had known about this blade a long time ago as it would've made life a whole lot easier for sure. The hard rubber piece across the bottom keeps your driveway from getting torn up too and the plow self adjusts to conditions of the driveway as I had ice underneath parts of the snow (I bought it later in the winter season) and it just adjusted and glided right over those parts (I never expected it to be able to get the 2 inch-thick ice off) and I was worried it might hurt the plow but it didn't; it just went over it! Didn't tear up the rubber at the bottom at all! We had a winter like we haven't had in years and it was able to push fairly high piles of snow. My son told me that he thought I was having too much fun out there and he was correct! Temps were so cold here that day, -20F but inside the Jeep it was nice and toasty! 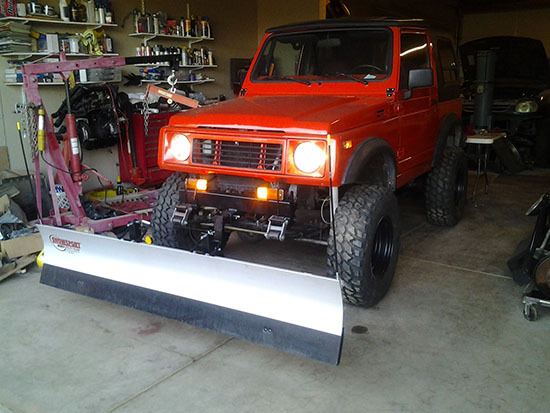 I would recommend this plow to anyone, especially women! I love it! And,obviously, I just can't say enough wonderful things about it!! One of the best investments I've made!! Ordered it online, directly from Agri-Cover and it got here in three days, during lousy winter conditions across the Midwest! Couldn't be happier with this plow blade!! " " I bought the Snowsport last year and wouldn't you guess.... no snow! But this year has made up for it with several snowstorms. No more winterizing a snowblower, hoping the gas is still fresh, and standing in the cold for hours with a snowblower and/or shovel. Open the garage, pin the plow to the rear hitch, and back up. If I am lazy, I do one plow of my 100ft driveway (in my warm truck) and hop back in the garage. When I feel really adventurous, I spend 10 minutes on the driveway and do two or three runs. 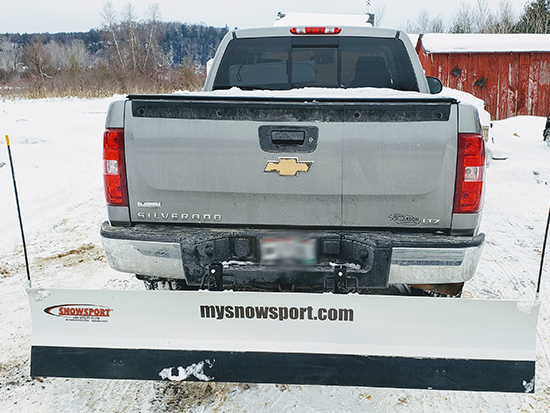 The plow does sit a hair too high on my Dodge Ram rear hitch, so the strap down helps. Great product- straightforward, no motorized parts/gas to deal with, quick clip on, and a huge time and back saver!!! "